There are 5 major "dead" foods that fuel the major diseases and health problems, including high blood pressure, obesity, chronic fatigue, Type 2 diabetes, heart disease, cancer, arthritis, osteoporosis, and other systemic diseases. When consumed in excess with a sedentary lifestyle, these "dead" foods turn the body acidic, cause inflammation, and slowly damage or kill the body’s cells and create biochemical, neurochemical and hormonal imbalances that trigger unhealthy food cravings. These chemical imbalances, in turn, devastate your health physically, biochemically, hormonally, emotionally and spiritually. Over a period of years, the body breaks down and becomes susceptible to the aforementioned major diseases and health problems. You must avoid these foods if you want to live a healthier life with less financial woes. If you're diabetic or overweight, you need to avoid most of these foods like the plague -- unless you like being diabetic, fat and taking a lot of drugs. For those of you who are familiar with superior nutrition, there should be no surprises with the following list. 1: Refined flour, starches includes all foods made with refined flour or starch such as white bread, enriched bread, wheat bread, white pasta, white potatoes, white rice, macaroni, cereals, crackers, donuts, pancakes, pastries, biscuits, spaghetti, cakes, pies, and other processed flour-based starchy foods. Warning: Avoid potatoes, corn, and soybeans, which are the most common genetically-modified (GMO) foods. Other common GMO-foods to avoid include canola oil, vegetable oils, margarine (cottonseed oil), cereals, sugar beets, farmed salmon, other farmed fish, cow's milk, baby formula, and artificial sweeteners (i.e. aspartame). Unfortunately, many processed foods and some restaurant foods are now GMOs, so be careful. 2: Refined sugar includes all foods made with high fructose corn syrup, corn syrup, refined sugar, sucrose, maltose, dextrose, brown sugar, artificial sweeteners, and processed honey. Author's Note: During my recovery, I had come up with a list of about 100 foods and beverages that I had to avoid. Then, based on common attributes, I was able to fit these foods into several categories that I eventually reduced to the above 5 groups. 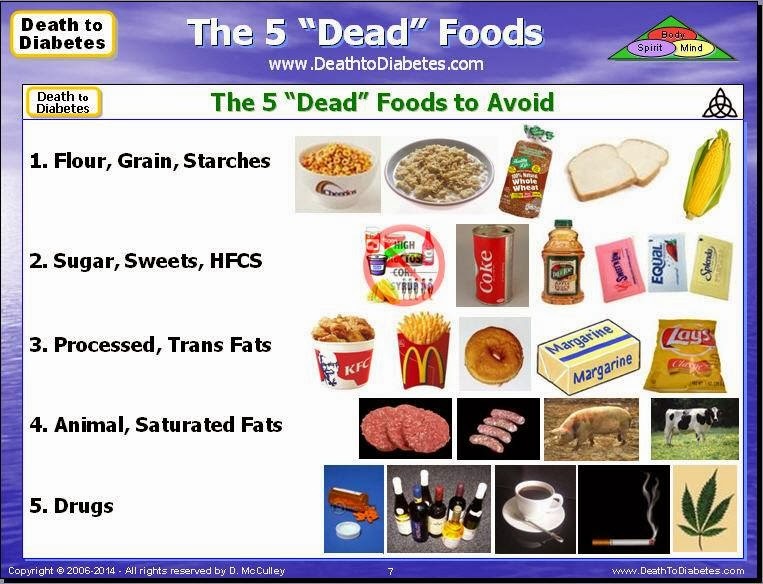 Note: There is a subset of these 5 "dead" foods that fuels diabetes and heart disease faster than other typical "dead" foods. I refer to these foods as "The Triple-Killers". Note: For a complete list of "dead" foods (and "live" foods), refer to Chapters 5 and 6 of the Death to Diabetes book. We all know that exercise is important, but, most of us usually try to find ways to get out of exercising. Here are some of the more common excuses for skipping exercise along with ways to combat those excuses. I don’t have time: This is by far one of the most common excuses that people use. People that use this excuse are actually saying that exercise is not enough of a priority to make it on their daily or weekly to-do list. If you fall into this category, then it’s time to review your daily priority list. Certainly there is something less important that you are doing for 10-15 minutes every day that can be replaced with exercise. After all, exercise is one of the most important things you can do for yourself and your family to ensure that you live a high quality life. Try to increase your daily physical activity and integrate exercise into your daily life. I’m too fat (or out-of-shape): Unless your doctor has forbidden you to exercise, then it’s very unlikely that this excuse has any validity. If you are extremely out-of-shape, then you simply need to start with baby steps. Walking is always a great place to start. You may have to start with just five minutes. That’s okay. You can gradually add more time each week. If walking is not an option, then you could try some pool exercises. There are many beneficial strength training exercises you can do while sitting with a resistance band, flex bar, resistance chair or a rowing machine. I’m too tired: This is a common excuse, especially with diabetics, overweight people and people who have insulin resistance – all because of poor nutrition. Without proper nutrition (fuel), the body cannot produce the necessary energy for exercise, leading to fatigue. This excuse also creates a vicious circle because the more sedentary you are then the more tired you become; and, the more tired you are then the less appealing exercise sounds. Exercise can actually make you feel more revived then a nap because it stimulates your lymphatic, immune, and cardiovascular systems – especially if you provide your body with the proper nutrition. Regular physical activity increases your energy level. In addition, consistent exercise helps you to fall asleep faster and sleep better, which allows you to feel rested every day. I really don’t like to exercise: This is usually due to the boredom that you feel during exercise or the fact that your body not only feels achy after exercising but the fact that it aches for the next couple days. Many people still have the old “no pain, no gain” mentality and think that in order for exercise to be worthwhile you have to be miserable doing it. This just isn’t true. Some people don’t like to exercise because they don’t like to sweat. Actually, you don’t have to work up a big sweat every time you exercise – it’s all about just getting the body moving. Consider things that you really like to do. If you prefer competitive situations, then consider joining a recreational sports team. If you are a social person, join an exercise group or take an exercise class with your friends. If you enjoy spending time alone, then try yoga or evening walks. And, don’t over do the exercise – that is part of the reason for the sore muscles. I’ve tried and failed in the past: It’s true that it can be difficult to get motivated to exercise after you’ve failed before, but isn’t your health worth another try? If you’ve been unsuccessful in the past, then re-evaluate what went wrong. Did you try to do too much, too quickly? It’s very common to be overzealous when starting out and end up either burning out or getting injured early on. Did you set unrealistic goals for yourself? Try to establish small goals that are truly achievable, for example, that you will workout three times a week for the next month. I’m too old to get started: It may sound cliché, but you are never too old to get started. Everyone can benefit from exercising. Even if you are a senior citizen you can reap many rewards from starting an exercise program. Okay, so maybe you won’t be a marathon runner or a bodybuilder, but you’ll be able to carry your groceries, walk the stairs easier, play with your grandchildren, improve your balance, and improve your glucose control if you’re diabetic. And, more importantly, you’ll enjoy your meals because you realize that the meals are providing the extra energy you didn’t have in the past. The inconsistent weather makes it difficult, or I don’t have any exercise equipment: Nice try, but you can exercise indoors and get your heart pumping without any fancy exercise equipment. Don’t underestimate what you can do with things that are already in your house. For example, if you have a flight of stairs then you have an awesome way to get your heart rate up by walking or running the stairs. Grab a couple of soup cans to emulate dumbbells for strength training exercises. I can’t afford a gym membership: You don’t have to spend a single dollar for a gym membership in order to get fitter. Just walking outside is a great place to start. Also, home fitness equipment has become very affordable and accessible. For as little as $35 you can buy some great home equipment that will really challenge your body. A resistance band, a couple of small hand weights and an exercise ball allow you to work every muscle group and even obtain a good cardiovascular workout. I don’t know what exercises to do: There are literally dozens of ways to learn what exercises will help you. There are hundreds of books, websites, television shows and videos that offer advice and tips. If you have the money, another way to ensure your workouts are most effective is to hire a personal trainer or an online personal trainer. They can guide you every step of the way so that you don’t waste any time doing exercises the wrong way. Or, just increase your daily physical activities, i.e. take the stairs (instead of the elevator); gardening; mowing the lawn; mall walking while shopping, dancing, cleaning the house, park farther from the store and walk, exercise on a stationary bike while on the phone or watching TV. I just can’t get motivated or I don’t want to change: Keep in mind that most of us are resistant to change. So, find something that will motivate you to exercise. For me, initially, it was the fear of dying. Later, it was the feeling I got from a good exercise session. For you, it may be your spouse, your children, your grandchildren, the quality of your life, or it may be financial (less expenses for drugs, doctors and hospitals). To help you get started, set small, short-term goals. Start with a promise to just take the stairs instead of the elevator, for example. Then you might move onto scheduling 10 minutes of activity a couple of times per week. Also, make a list of all the positive benefits exercising has on your life. Your list might include giving you more energy, reducing your health ailments and more. The list should be pretty long. Post it somewhere that you will see it regularly and it can serve as a reminder to you as to why you need to workout. Another option is to take a yoga or T’ai Chi class. They are two great ways to get the physical activity you need and learn the techniques of proper breathing and relaxation. Yoga is a physical way of life emphasizing the harmony of the body and mind, and a philosophical way of life that is based on Eastern metaphysical beliefs. T’ai Chi is an ancient Chinese art of exercise and self-defense with an emphasis on relaxation, both physical and mental, which leads to developing internal strength. T’ai Chi is classified as a low impact aerobic exercise comparable to walking that is used as a therapeutic exercise for people who are recovering from illness or injury, or for those who are beginning an exercise program. There are new muscle activation techniques that provide maximum benefits in less time by utilizing a series of sequential movements designed to put the body in proper functional alignment, establishing increased strength and flexibility of the spine, better neuro-kinetic flow, lymphatic function, and an increased metabolic rate. In addition, you can utilize these muscle activation techniques while you are at work, shopping, walking, driving or doing everyday household chores – consequently, reducing the amount of time you need to spend exercising each day. Contact our wellness center for more information. We all know that exercise is important, but, it seems that we either do not have the desire or the time to exercise. Other people who are exercising eventually stop exercising after becoming bored, frustrated or discouraged due to the lack of progress in their health, weight loss or other health goal. Personally, I know that exercise is important. In fact, some experts call it the "Fountain of Youth"! But, even though I know this, I still don't really like to exercise! There must be an easier way to deal with exercising, right? When I was younger, exercise wasn't a problem, because I got my exercise by trying to play basketball and tennis. Today, most of my friends now play golf, but, I could never get the hang of hitting that little white ball. Ugh! Plus, is that really exercise? The following are some tips to get you started with exercise and keep you going for the long term. Schedule your exercise sessions on your calendar as if they were any other important appointment. This way, you will be able to balance your exercise program with family, work and social activities. Again, you will be more successful if you fit exercise into your current lifestyle. A little is always better than none. If possible, try to build your exercise/physical activity into your daily activities, e.g. walking/bicycling to work, shopping, walking in the mall, house chores, painting, gardening, mowing the lawn, walking up and down the stairs, etc. Don’t work out too hard or too fast at the beginning. If you do, you will end up sore and uninspired. It’s better to work out 2-3 days a week for life than to work out 6-7 days a week for a couple of weeks. Consistency is the key. When you feel like skipping a workout, get yourself to do some form of exercise for at least 10 - 15 minutes. Most people struggle during that initial 5 minutes, but once they get past that 5-minute mark, they are actually able to complete their entire workout. (If you don’t, don’t worry about it – 10 minutes is still better than nothing). When you get bored or unfocused, change your exercise routine a bit by adding a yoga, aerobics, Pilates, swimming or dancing class. If you don’t care to join a gym, there are many wonderful classes at the local recreational centers. Try a new exercise video or machine, or, try an outdoor activity such as bicycling or a beach walk. Give yourself a little leeway - if you miss a workout or even an entire week, get back on track as soon as possible. Setbacks and challenges are normal. The sooner you get back on track, the sooner you will reach your goals. Remember - fitness is not about being perfect, but about a series of healthy choices that you make consistently. It is not an all or nothing proposition. If possible, work out in the morning. You will feel more energized all day and will avoid “life” getting in the way of achieving your exercise and health goals. If possible, get in the habit of taking a 5 - 10 minute walk after lunch and/or dinner, especially if the weather is nice. Walk with your partner or a friend. You will be amazed how well you feel physically and emotionally. Keep a pedometer and a fitness journal to chart your progress and accomplishments, and provide motivation. Try to limit the number of times that you use the weight scale to once a month or once a week at the most. As you get fit, lose fat and gain muscle, you will actually drop inches and pants/dress sizes and not move the scales that much. Evaluate your progress every 6 - 8 weeks and increase the duration, frequency or intensity of your workouts to stay challenged and inspired. If you need help, ask a fitness professional or instructor for suggestions and advice on how you can most effectively achieve your goals. 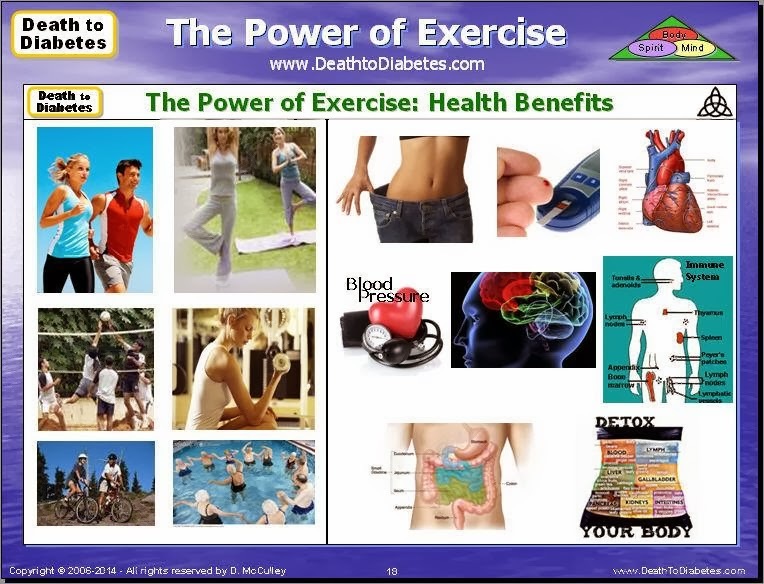 There are also a variety of other resources on health and fitness available on the web. Note: For more information about exercise and how to overcome the excuses, refer to the post about Exercise and Excuses. 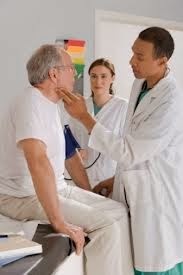 As part of the Death to Diabetes Wellness Program, we recommend that you meet with your doctor(s) on a regular basis. You should visit your primary care physician and/or endocrinologist on a regular basis to review your progress, your blood glucose readings, corrective actions, and other notes – at least until you have your blood glucose level under control. Depending on your health needs and your health goals, you should get a complete physical and set of blood work every 6 to 12 months to identify any trends that may be getting overlooked, especially if you’re not making any significant improvements. If you really want to get more out of your doctor appointments, read the following guidelines and tips for things that you can do before, during, and after your appointment. Make notes and write down any questions. 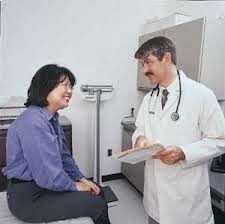 However, don’t hand your doctor a huge sheaf of printouts and expect her to respond to them during your visit. And don’t try to diagnose your symptoms or self prescribe your remedies. It’s still up to your doctor to do that. The following is a set of guidelines to help improve the effectiveness of your appointments and the relationship with your doctor. If you are unable to establish a better partnership with your doctor, let him/her know your concerns. If there is no improvement, or you have a concern with taking drugs, consider talking with a doctor in the field of alternative medicine, e.g. a naturopathic doctor (www.naturopathic.org); or, work with a diabetes wellness coach who has a medical background. Key Point: Ensure that the treatment is being designed to repair your body, specifically, the defective sick cells in your body – not just to treat the symptoms of high blood glucose levels. This is a part of a video where I was being introduced at a medical conference by one of the doctors. This doctor was fascinated by the fact that it took an engineer to solve one of medical science's more complex diseases. He was also amazed that, during his radio call-in show, that I was able to answer the questions from some of his listeners, while the two doctors on the radio show couldn't answer most of the questions. During my recovery from the diabetic coma, it seemed like that almost every week, something interesting would happen that I couldn't explain. But, after a couple years, things settled down. Then, one day, I got a phone call from a doctor asking me if I'm the guy who survived a diabetic coma and wrote a book about it. It turns out that he wanted me on his call-in radio show with 2 doctors where I would play the role of the diabetic patient. I agreed because it would be a great opportunity to hear from other diabetics calling into the radio show. During the first part of the radio show, the radio show host/doctor introduced the 2 doctors and myself; and, had each of us talk about ourselves for a quick minute or so. Then, the radio show host/doctor asked some questions about diabetes that each of us would answer from our perspective. Then, a couple people called in to the show with their questions. But, the 2 doctors couldn't answer the questions! They said something like: "That's an excellent question, but, I'll have to get back to you on that." Or, they said something like: "That's a good question, but, I don't have any information about your medical history to answer that question." After a few minutes of this, I said: "Excuse me, but, I think that I could answer the question from the last caller." The radio show host/doctor said, "OK, sure, give it a shot." (I could hear the 2 doctors snickering in the background). After I answered the question, there was dead silence. (I thought that I had said something wrong or inappropriate). Then, the radio show host/doctor said: "Wow, DeWayne, that's a very interesting point of view, but, do you have any medical data or clinical studies to back up what you just said?" (Again, the 2 doctors were snickering in the background). I said: "Yes, as a matter of fact, there was a clinical study conducted in 1997 in Boston, that was documented in the New England Journal of Medicine. And, concerning the previous question, there were several studies done in Germany and, I believe, one by the Mayo Clinic in 1990 or 1991, that substantiates my earlier comment about Type 2 diabetes pathophysiology at the cellular level. And, recently two medical doctors have admitted that reversing Type 2 diabetes is feasible, measurable, and quantifiable." Within 30 seconds, the radio show's phone lines were ringing like crazy. The 2 doctors were shocked and flabbergasted and weren't prepared for the deluge. On the other hand, I welcomed it. It reminded me of years ago when I was still just a rookie engineer, I volunteered to work in the "War Room" and take phone calls from technicians in the field who were having problems with the machines in the customer's offices. Originally, I was only supposed to be on the radio show for the first 15-20 minutes. But, I ended up staying on the show for the entire hour and answered most of the questions. A few days later, the radio show host/doctor called me and said: "DeWayne, I've never got that kind of response from my audience before, even when I had a celebrity doctor on my show. You have GOT to come to our annual medical conference and speak about your recovery, your diabetes program and how it's helped other diabetics." I was very fortunate the first time that I ended up being interviewed on a local TV news show . I received a phone call around 4:30am from a local news station asking me to come down to the station for a morning interview because someone else got sick and couldn't make it. So, I didn't have to get a haircut or anything plus I was still quite sleepy and I remember it was raining. This was by far my worse interview -- but, it taught me to better prepared in the future. I couldn't believe that I was on the news! But, for some reason the assistant TV producer loved the news story even though I felt that I had done a poor job and looked a little disheveled. The producer felt that more people needed to know about my story, so she tried to get the news story on the evening news and national news so that more people could see it, but, it was turned down. Later on, I found out that a senior executive had the story squashed. By this time, I had talked to the producer's mother and helped her with her diabetes. Now, the producer was even more adamant about getting my story on the national airwaves. But, eventually someone pulled her to the side and told her that it wouldn't be good business for this story to reach the mass public. So, the story died there. I was really disappointed that my news story never made it out of the Rochester, NY area. But, my daughter gave me the idea to put the story on YouTube. As a result, this news story has reached a few more thousand people, but, not enough people to really have any impact. More diabetics need to know that taking diabetic drugs should not be a life sentence.